LAS VEGAS, Jan. 3, 2017 /PRNewswire/ -- International Consumer Electronics Show – Built for the cost-conscious yet uncompromising Internet-minded millennial, the Honor 6X is the perfect technological budget beast. Embodying the "double or nothing" motto that millennials live and breathe, the Honor 6X breaks new ground at CES 2017 with its premium dual-lens rear camera, extended battery life and rock-solid performance. 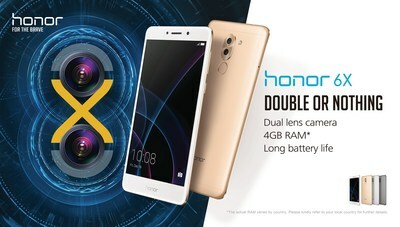 "Geared towards those unwilling to cut back on performance, Honor 6X is a device engineered with uncompromising excellence," said George Zhao, president of Honor. "Understanding the 'double or nothing' lifestyle of millennials, we designed Honor 6X with enough muscle power to allow them to share, explore, and enjoy life to the fullest." Honor 6X features an innovative dual-lens rear camera offering a wide aperture range (F/0.95-F/16) giving you all the latitude to unleash your creative potential. The main 12MP camera is responsible for the composition of the image while the 2MP camera provides depth of field information, resulting in beautiful shots that are sharp and crisp. Combined with the camera's wide aperture (F/0.95), the Honor 6X produces professional-looking background blur to make your subjects stand out. This, coupled with a 1.25um pixel size, enables the Honor 6X to capture quality shots even in low-light settings. The Honor 6X's camera uses Phase Detection Auto Focus technology, which allows for an ultra-fast camera focus speed of 0.3 seconds. Fueled by a Kirin 655 boasting an octa-core architecture, the Honor 6X is built to provide a glitch-free user experience. Kirin 655 packs four cores clocked at 2.1GHz and another four at 1.7 GHz. Supported by 3GB/4GB RAM and a powerful i5 co-processer, the Honor 6X allows you to seamlessly game, browse and listen to music or run multiple apps at the same time. To further boost the agility of the device, the Honor 6X features Honor's Smart File System, which enhances Android's EXT4 system, preventing fragmentation and increasing the lifetime performance of the Honor 6X. Markets included but not limited to the United States and Europe. Channels included but not limited to those listed.